Tickets will be available online at MetroTix.com, by phone at 314-534-1111 and in person at the Fox Theatre Box Office for the following shows: FUN HOME, ANNIE, FINDING NEVERLAND, AN AMERICAN IN PARIS, SOMETHING ROTTEN!, Roundabout Theatre Company’s CABARET, MOTOWN THE MUSICAL, THE ILLUSIONISTS, DIRTY DANCING–The Classic Story On Stage, RENT and MAMMA MIA!. 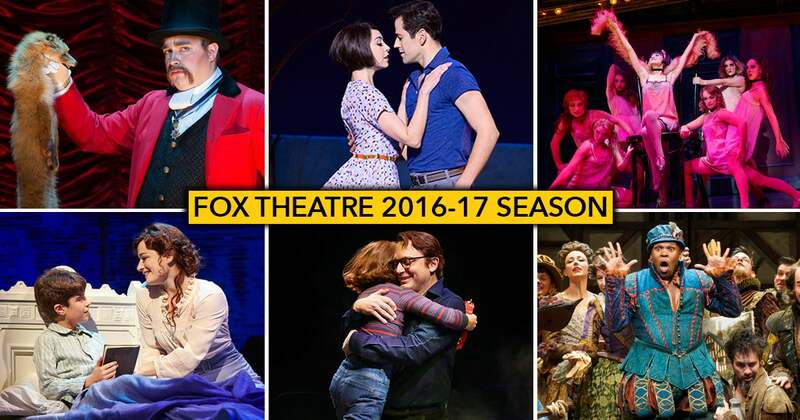 Please refer to FabulousFox.com after September 1 for current pricing for individual shows. AN AMERICAN IN PARIS is the new Tony Award®-winning musical about an American soldier, a mysterious French girl, and an indomitable European city, each yearning for a new beginning in the aftermath of war. Acclaimed director/choreographer and 2015 Tony Award-winner Christopher Wheeldon brings the magic and romance of Paris into perfect harmony with unforgettable songs from George and Ira Gershwin in the show that earned more awards than any other musical in the 2015 season! the New York Times raves, “AN AMERICAN IN PARIS is a triumph! Pure joy!” and the Wall Street Journal declares, “Once you’ve seen it, you’ll find it hard to settle for less ever again.” Don’t miss this stunning Broadway hit when it arrives in St. Louis on its first national tour! Direct from Broadway, this mind blowing spectacular showcases the jaw dropping talents of seven of the most incredible Illusionists on earth. THE ILLUSIONISTS – Live From Broadway has shattered box office records across the globe and dazzles audiences of all ages with a powerful mix of the most outrageous and astonishing acts ever to be seen on stage. This non-stop show is packed with thrilling and sophisticated magic of unprecedented proportions. DIRTY DANCING – The Classic Story On Stage is a record-breaking live theatre sensation, exploding with heart-pounding music, passionate romance and sensational dancing. London’s Sunday Express says, “This crowd-pleasing stage adaptation hits the jackpot!” Featuring the hit songs, “Hungry Eyes,” “Hey Baby,” “Do You Love Me?” and the heart-stopping “(I’ve Had) The Time of My Life.” You’ll have the time of your life! In addition to the above-mentioned 11 shows, the U.S. Bank Broadway Series also includes A GENTLEMAN’S GUIDE TO LOVE & MURDER, ONCE (single tickets already on sale for both shows) and Disney’s THE LION KING (single tickets on sale date to be announced soon). The six-show season ticket package is currently on sale and subscribers to the package can purchase advance tickets for any of the specials, including THE LION KING. Call 314-535-1700 for more information. Group reservations of 15 or more are also available now by calling 314-535-2900.